No more earrings lost behind the dresser! 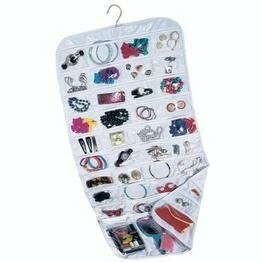 This dual sided jewelry organizer keeps all your fine accessories protected at hand. Soft, clear, PEVA protects jewelry from nicks and scratches and allows you to see each pocket’s contents, so you can browse leisurely or find what you need quickly. With 40 pockets on either side, you have the space to store it all! Smaller pockets at the top hold earrings and clips, while larger pockets at the bottom hold anything from chunky necklaces to hand mirrors and hair accessories. With a built-in hanger, the Ultra Jewelry Organizer slips easily into your closet, so your accouterments are always nearby to perfectly coordinate any look. Measures 35″ L x 18″ W.